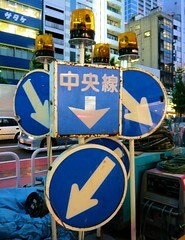 The previous post was an attempt to get the advanced Kanban open badge. This one follows up with an answer to the question posed in the P2PU Badges Project to my application and as wee thought about badge systems. The feedback was questioning why I decided not to use the ‘Work in Progress’ system to limit the number of tasks in the doing section. I’ve already described the board I set up was to be used for Radio Edutalk. I’d had changed to do,doing and done for possible guests,shows and broadcasts. I didn’t want to limit the doing(shows) section as that number will reflect the shows that are ready to go. A long list there is not a sign of doing too much but one of being prepared well in advance. The feedback section in p2p is not that great. There is nowhere to enter answers to the question there. Hence this post and some blue sky thought. I wonder if a badge could send a trackback or something like it to a blog post, with feedback and /or a badge? Maybe something trackback like (at least to my eyes) such as a Webmention (more:Webmention – IndieWebCamp). So ideally (or in my imagination), the badge page has a URL. I write blog post in response giving evidence as to why I should get the badge. The badge pages gets pinged, creates my ‘project’ lets an approver/expert know. This person reviews the work and adds feedback to the project page and/or awards the badge. This action pings my blog post, adding the feedback/badge as a comment. Responding to the comment could answer feedback etc. I am typing this pretty much from ignorance of the current badge scene perhaps this is already on some cards somewhere or already been rejected as a daft idea? Thanks to Doug Belshaw who provide the opportunity to play with badges again. 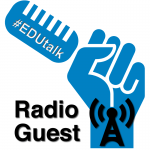 Recently we have had quite a few guests on Radio EDUtalk who have talked about or been interested in open badges1. As I’ve blogged about before I am not completely sold on badges for learning but I am interested enough to want to try them out is a small way. Unfortunately I don’t have any pupils to use a guinea pigs. I therefore though it might be worth a wee experiment on EDUtalk badges. In the settings there is a WPBadger Configuration section where you set up an email that will be sent when a badge is awarded. The Badges section is where you create Badges, these look like custom posts. They contain a description and an image. There is an Awards section where you award the badges by creating posts. It took me a few attempts to get to a system that seems to work. I had to use the github.com version rather than the one in the wordpress plugin repository. I also made a few mistakes setting up badges, you need to limit the description string to long and then had single quotes in a description. Once I had changed that things began to work. I’ve not tested the system to any great extent, Robert Drummond kindly helped, but it seems to work. I don’t think I’ll award badges willi-nilly to all our previous guests of contributors, but please get in touch if you have been a guest or contributed audio if you want me to send you a badge and help testing the system. It looks as if setting up a badges system is pretty simple for teachers who have access to a wordpress blog they can install plugins in via FTP and pupils or learners with a mozilla backpack. I’ve blogged a fair bit about badges but still am conflicted about their value in the classroom. Perhaps because I’ve not used them in anger. Doug Belshaw when talking at the SQA assessment event last month, lit a wee lightbulb, he said something like: Badges from you community to show others, that is it for me, it is the community that issues the badge that is important. I love my talktina badge badge as I value the community that issued it. At this point I mentioned that the glow eportfolios were moving out of WordPress into some sort of sharepoint solution. Pointing to the SICTDG post: Moving e-portfolios to a Microsoft blog which at the point of writing has 31 Comments. I’ve put a bunch of todays ensuing tweets into Storify as I think an interesting tale is emerging. One thing that becomes apparent reading the tweets and comments on the SICTDG post is that quite a few folk are not clear about what is happening with glow. The way forward is a wee bit confused. This is not a good situation to be in. Glow despite its many technical failings drove ict into many areas of the curriculum. This was largely due to the huge effort by LTS and LAs to promote and train folk in using glow. This is how I understand how things played out. I may very well be wrong and would love a really clear picture. The contract for Glow was coming to an end, there was a procurement process started to shape the next iteration. Mike Russell announced on YouTube that he was cancelling the procurement and the new glow would be based on Free tools and Open Source Services. The Scottish Government/LTS/Education Scotland started planing the new glow. Everything was looking good for a while and according to various sources it was coming down to a choice between Google Apps for Education and Microsoft 365. Rumour had it that google was in the lead. For some reason the Government then announced a invitation to tender rather than just make a choice between free solutions. Google Withdrew from tender process. Come on then Mr Russell; it’s over to you. How about cutting through all the civil service failures, restoring Andrew Brown and his team to the Glow successor project, and getting them to carry out a review of just what has been achieved, and what’s possible now there’s a little more breathing space. Andrew Brown is one of the most respected figures in education today, and together with the international reputation of Ollie Bray and technical expertise of Charlie Love, he could manage the birth of a successor to Glow which, if not totally future proof (what is? ), is at least what the people want, would work properly and meets the needs of learners and practitioners. It would also be well managed and provide better value for money than its predecessor. To ensure continuity we have taken the step of extending the current RM provision through to December 2013. Microsoft have agreed to provide the tools and services of their integrated application suite ‘Microsoft Office 365 for Education’ for free through to December 2014; this was the first offer of its kind in the world for a national schools project. There would be an ICT Education Excellence group. The excellence group will have the immediate task of scoping the long-term user-centred future of Glow. The development of GlowPlus by the ICT Education Excellence group. We know about the first of these through the information provided in glow itself: Migration of Glow to Office 365 (glow account required) and the second by a fair bit for tweeting and blogging by members of the group. Local Authorities have been kept up-to-date though the Key Contacts. There seems to be very little joined up thinking between the two plans. Education Scotland and the ICT Education Excellence group do not seem to be working in the same room. My fear is we are going to get a two step transition, Glow to MS 365, MS 365 to GlowPlus. This does not seem like a great idea. I think I’d have preferred to stick with Glow 1 and then go straight to GlowPlus if that is where we are heading. I can’t imagine how we got to this point without some bad decision making by the government. Over the last couple of years one of the major uses of glow has been the development of e-portfolios. Designed in part to help with the profiling of pupils progress and the profile for pupils at p7 and (this year) s3 the e-portfolio solution used by more that 60000 pupils in Scotland is based on the wordpress blogs provided by Glow. WordPress is not going to be provided by Glow 365. There is a new MS365 based solution in preparation which will replace the blogs at the end of this session. On the back of the introduction to blogs though e-portfolios the use of the WordPress blogs for class and school blogs seem to have picked up. As I understand it these to will be migrated to 365 but some features and structures of wordpress blogs may not be supported. According to tweets by members of the ICT Education Excellence group, wordpress is very much part of GlowPlus, it can be seen and tested in Glew which has been developed by Charlie Love a member of the ICT Education Excellence group. There has been a reasonable amount of anxiety surrounding this for example on the the SICTDG post Moving e-portfolios to a Microsoft blog. So are we going to move from wordpress to 365 and back over the next few years? The other area of glow may have similar movements, Adobe Connect the video conferencing tool in glow will be replace by a MS 365 solution will that change again in a year or two, is the new solution better than the old one? RT @johnjohnston: eportfolios look like going to sharepoint solution – http://sictdg.wordpress.com/2012/11/08/moving-e-portfolios-to-a-microsoft-blog/ … And they want me to set up 300 WordPress blogs? Most of the above has been an attempt to list where we are and where we are going. I’d love some authoritative explanation giving an overview of where we are going and why?. The following are just some personal thoughts and opinions. I feel we have already started losing traction with glow. I believe there is a lot of good to be had from a national intranet. I also believe that a lot of the best of glow has come from teachers and others trying to bend what they have been given into tools to met real needs. Recently, I’d guess, that eportfolios are by far the most used section of glow. These take the rather limited and old wordpress setup that glow provides and twist it to fit the needs to Teaching and Learning in Scotland. To my knowledge most of this twisting was not done by RM or professional programmers but by Education Scotland’s Alex Duff. This post started with discussions on twitter by Ian Hallahan, Robert Jones and David Gilmore on possible enhancements to wordpress blogs and eportfolios, adding open Badges, ideas from teachers who have proven time and again that they can improve open source tools for their circumstances. I am not a WordPress fanboy, this blog is not using WordPress, but WordPress is a class of software that can be hacked (in a good way) to fit users needs by users. This facility is shared by many open source solutions. Mike Russell suggested glow would be built on OS software, the next revision is not. We may need to consider how to find Ctrl-Z on some of those current changes. Yeah – @Feorlean’s mission for #ICTEx is not designed to be stymied by short termism & quick fixes. I am guessing Ewan knows a bit about @Feorlean’s vision. I am wondering if @Feorlean’s eye is on the glow ball? Is it to late to Ctrl-Z on some of those current changes I wish someone would let me know. I’ve been keeping half an eye on the Mozilla Open Badges project, mostly through the blog of Doug Belshaw. 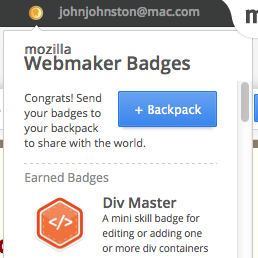 Yesterday I read Webmaker Badges Are Go! and decided to check to thimble and how it had incorporated badges. Thimble is an in browser html editor with live preview. Unfortunately I was reading Doug’s post on my iPad and dived into thimble on that. This was not the greatest experience, selecting text was a total pain and the standard iOS text editing was disabled. I could not copy or paste. I managed to do a bit of a better job by linking a bluetooth keyboard where I could copy and paste via keyboard shortcuts. Selecting text was still very difficult. I then switched to my macbook. Although this is not a recent model it is usually fast enough to get thing done. It runs 10.6 and I use it for all sorts of things. Unfortunately it did not seem fast enough to edit thimble. Again it was hard to select text, clicking somewhere to move the cursor was hit and miss and I deleted some bits of code without meaning too. This could be very off-putting for a school pupil or someone else unused to editing html. I did test Safari, Firefox and Chrome none were much good. After not having much fun with my macbook I switched to my work macbook pro. This is not exactly a monster machine, 2.3GHx i5 with 8 MB of RAM, but it handled thimble a lot better. I began to see what was happening, thimble does a fair job of syntax highlighting as you go, alerting you to any errors. But the neatest thing was the integration of the badges. I had signed in with Mozilla persona at the top of the thimble page. As I added various bits of code to the page small alerts popped up to tell me I had earned a badge. Clicking on the badges button allowed me to send the badges to my Backpack. This entails accepting the badges and then you can organise them into groups. I guess all the code highlighting and checking to see if you have earned a badge is what slows down the iPad and older mac. Personally I don’t think I’d be very motivated by badge gathering but I could see this being attractive to some sorts of learners especially as you can show the badges you have earned on a public page and also embed them on your blog or other webpage. I’ve added some more notes about thimble on the thimble page I made. Open Badges Backpack is in beta, it says so in the url, https://beta.openbadges.org. It seems to be developing nicely and it is now a lot easier to get your head round how badges play out in practise. I can see some real use for thimble and badges in the classroom and I hope to test performance on other older computers soon. Hopefully it is better than on my old (2008) macbook or that the experience will improve over time. I hope too that Mozilla will not forget about iPad users as we are seeing a lot more of these in our classrooms now. Finally I just used the ‘Start From Scratch’ option in thimble, there are a lot of interesting looking starter projects that you can use to get ideas for what to make. I want all the children I teach to develop a love of learning, not for ticks, badges or scores, but for the buzz of learning. from: Robert Drummond » Blog Archive » 20% time Robert is giving his pupils free learning time in the same way Google developers get to follow their own interests, I am looking forward to see how this goes. Here is the exam. Write your own questions. Write your own answers. from: Seth’s Blog » Blog Archive » Tyler Cowen’s Unusual Final Exam I guess it would take a bit of work to get this going in class, but echo the 20% for me. When you click on ‘Sign in with Glow’ you will be taken to the Glow login page. Here you can login to Glow using your usual username and password. At Glew we won’t know these details and they stay secure with you. from: Using Glow to make a Glew Account | Glew.org.uk Charlie Love makes Glew an even more interesting choice. If I was in class I’d give it a go. “Mechanical MOOC” – a free and open introductory course in the programming language Python that weaves together existing resources (content, Web-based study groups, quizzes and so on). from: The Mechanical MOOC Audrey Watters point to this new MOOC, No degrees or credits or certificates or letters of achievement will be awarded, if I though it would only involve a couploe of hours a week I’d join up. Mozilla wants to create a generation of webmakers. 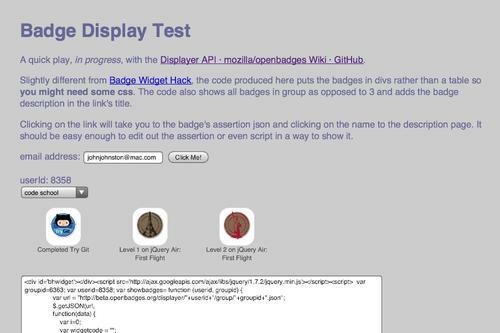 from: What we’re up to with Mozilla Webmaker (Open) badges. | dougbelshaw.com/blog Doug now works for Mozilla Foundation. I am all for making more webmakers, and am interested in how badges play out, less sure of badges effectiveness (see the first quote in this post). I suspect badges need to be augmented by personal or social media, I didn’t find codeacedemy badges much of an incentive. I am looking forward to seeing Doug speak at eAssessment Scotland this Friday. So easy your human companion could do it too! Audioboo Appeal « Teach Computing. What I am questioning, however, is whether the logic of Capital and private enterprise should be applied to the institutions of our state. Some things, after all, are public goods. from: Some thoughts on time, performativity, and the State. | dougbelshaw.com/blog a good question. Tuttle SVC: Should Teachers Consider TED a Reliable Source? Why, Exactly? Introduction to .htaccess – Codular I actually edited a .htaccess this week. I need to know a bit more, this should help. The whole conversation started by Doug Gaining Some Perspective on Badges for Lifelong Learning is fascinating (some flying over my head). Personally I’ve found comments more motivating than badges. for example, I worked a lot longer harder and learnt more after a few comments than I do on Code Year where Badges are auto generated. With the upcoming release of Mozilla’s Open Badges framework this group is an opportunity for educators and interested parties to discuss the various ways such badges could be used in educational contexts. I wonder if anyone at Glow Futures is following this? Could be interesting integrating this with the developing glow e-portfolios.